Have you arranged anything for to treat your mum this Mother’s day? If not I may have just the thing for you. Mum’s like nothing better than spending some quality time with their sons and daughters so treating her to a workshop where you can both make a beautiful bouquet of flowers together, whilst enjoying home made cream teas and cakes is a perfect gift! You don’t have to come with mum, I have had people buying the workshop place as a gift and also had groups of friends come together to make bouquets to give to their mum the next day. I always run these the day before Mothering Sunday so you can still enjoy the main day together. This year my workshop is being held on Saturday 30th of March from 10am – 12pm . We will be making wrapped, hand tied bouquets with a twist in the stem – I will give a brief demonstration of what to do before handing over to you to make your own, and I will be on hand throughout to help if needed. If you would like to book a place please follow this link. In April I had the pleasure of flowering a wedding for a gorgeous couple at Homme House in Much Marcle, Herefordshire. Roberta contacted me after seeing some work I had done in Vow Magazine and she was looking for a natural style of floristry, using lots of bright colour for her Spring wedding. I really loved Robbie’s bouquet which included beautiful ranunculus, tulips, freesias and anemones. Rather than the traditional domed bouquet we went for something assymetric with some flowers doing their own thing and softening the edges, giving a very natural look. The bridesmaids had smaller bouquets to match the bride and the youngest had a simple crown of foliage which looked absolutely adorable on her. 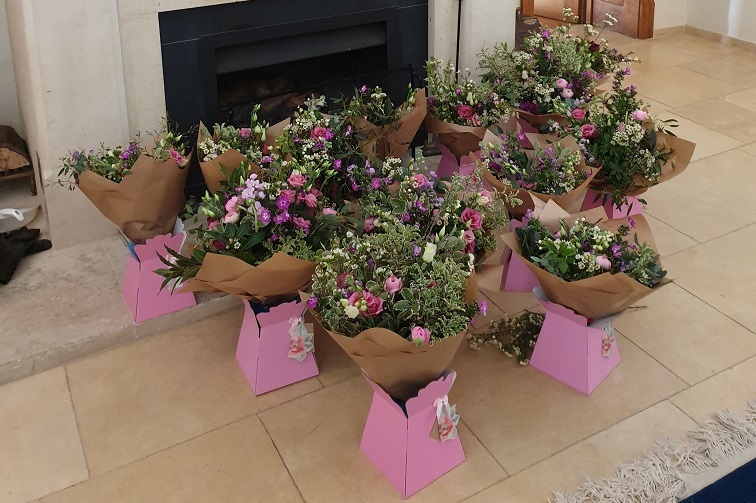 The family had booked the house for the weekend and we delivered the flowers the day before the wedding as they asked for lots of DIY buckets, giving them time to do their own table displays in the marquee. Many people go down this route now and we even run DIY wedding flower courses to teach you the techniques which will help you when doing your own flowers. No-one was left out at this wedding - even the dogs at the entrance had their own special collars with ribbon trails, making a very smart entrance for guests. I loved working with Robbie on this wedding - she was such a relaxed bride and had great taste so from the initial enquiry I knew this one would be good! If you are looking for flowers for your wedding I still have spaces available for 2019 and I can do everything for you, provide buckets of DIY stems, or do a mix of both like I did for Robbie. Please contact me now for more details. Send your mum along to one of my special mothers day workshops on Saturday 10th of March, or even better come long with her. Last year was really popular so I have two different time slots available this year. You will be treated to home made cream teas and cakes, plenty of refreshments and you will both learn to make a beautiful hand tied bouquet of seasonal flowers which you can take away. I did a workshop like this with my mum a few years ago and it was the best present. We combined it with a bit of shopping and a nice lunch and it was a really enjoyable and memorable day out. If you or mum can't make the 10th then you can order a gift bouquet, or vouchers which can be spent on flowers or workshops. Just get in touch for details or click here to book a workshop. Ok it's not quite Christmas but I have arranged to have the last few days work free so I'm now planning for next year and reviewing the last few weeks. It's been my first Christmas working full time at Pipley and I have loved it! I've hosted quite a few wreath making workshops, been making up orders for wreaths and eaten far too many mince pies and Lebekuchen. 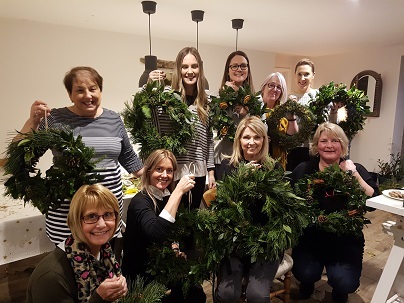 The mulled wine has been flowing and it's great to think how many doors now have a Pipley Flowers wreath decorating them. I'm also thinking more about next year. Workshops are one of my favourite things about my job and I have had great feedback on them with many people returning a second, or even a third time which I am really pleased about seeing as I held my first one in February. Next year there will be some new workshop subjects which I am super excited about including one aimed and brides who want to arrange their own flowers, and another in conjunction with a very talented lady who also runs a small business in the South West...details to be revealed soon! Of course there will also be a special Mothers day workshop and the popular hand tied bouquet experiences. 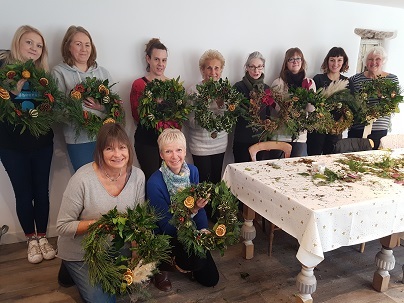 This month I was joined by a lovely group of ladies in my brand new workshop to celebrate mothers day by learning how to make their own hand tied bouquet of Spring flowers. The mums were either brought along by their daughters or had been bought the workshop experience as a gift. It was a little early for most of my flowers so I provided foliage and a few flowers from the flower farm and these were supplemented with some other beauties including ranunculus, scented stocks and scabious. We enjoyed home made bee sting cake and cream teas, and everyone seemed to really enjoy the day - roll on next year!